openSUSE (/ˌoʊpənˈsuːzə/) is a general purpose operating system built on top of the Linux kernel, developed by the community-supported openSUSE Project and sponsored by SUSE. After Novell acquired SUSE Linux in January 2004, Novell decided to release the SUSE Linux Professional product as a 100% open source project. 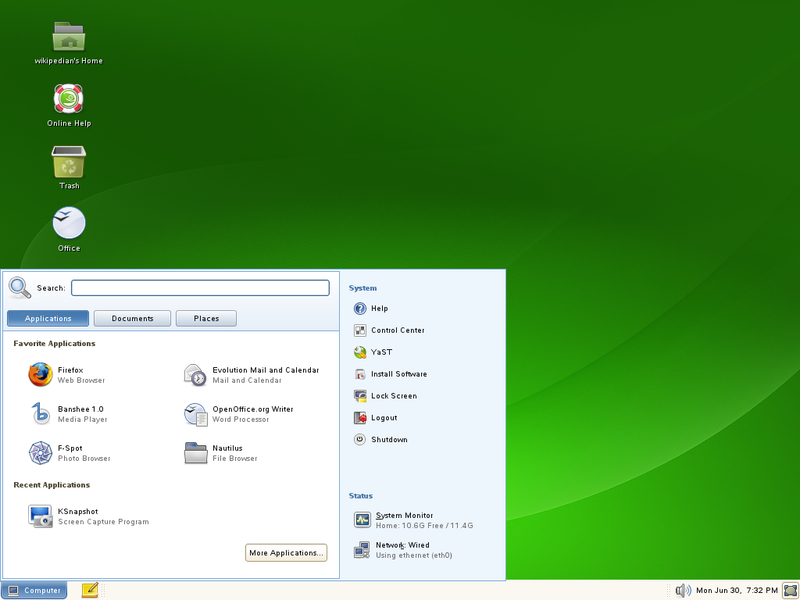 The initial release of the community project was a beta version of SUSE Linux 10.0, and as of March 10, 2011 the current stable release is openSUSE 11.4. In openSUSE the openSUSE Project community, sponsored by SUSE, develops and maintains SUSE Linux distributions components. 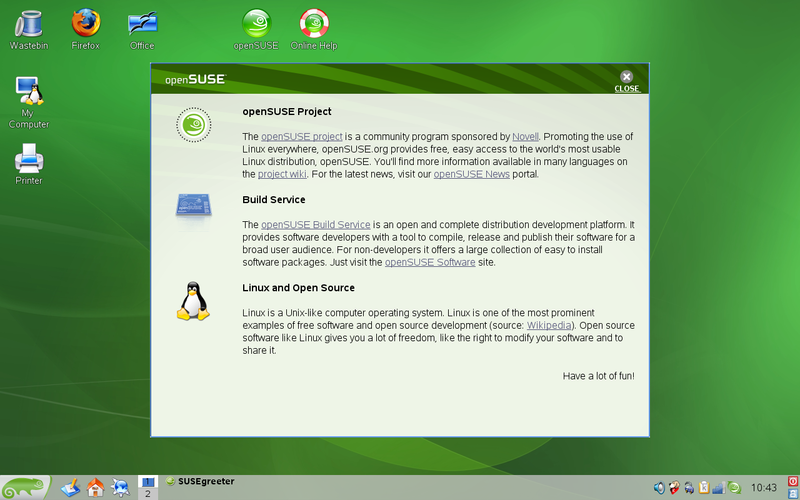 OpenSUSE is the successor to "SuSE Linux Professional". Beyond the distribution, the openSUSE Project provides a web portal for community involvement. The community assists in developing openSUSE collaboratively with representatives from Novell by contributing code through the openSUSE Build Service, writing documentation, designing artwork, fostering discussion on open mailing lists and in Internet Relay Chat channels, and improving the openSUSE site through its wiki interface. Novell markets openSUSE as the best, easiest distribution for all users. 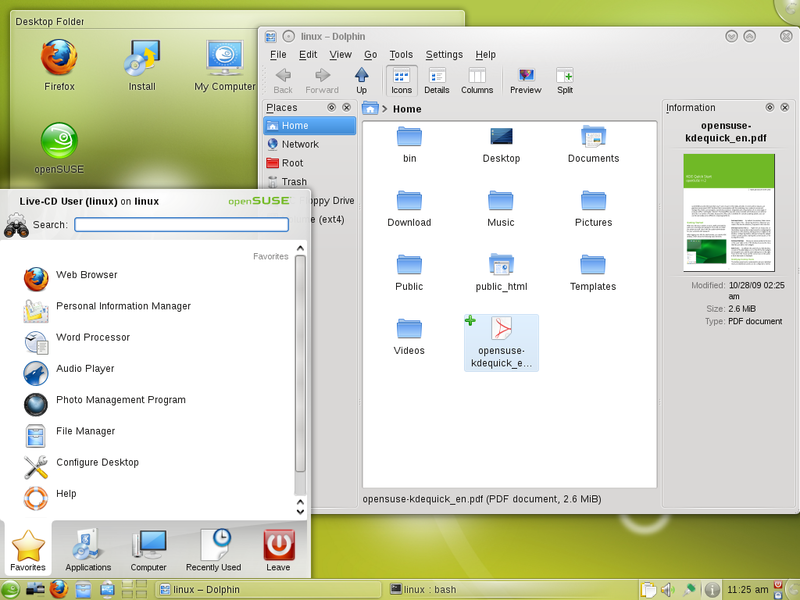 Like most Linux distributions, openSUSE includes both a default graphical user interface (GUI) and a command line interface option. 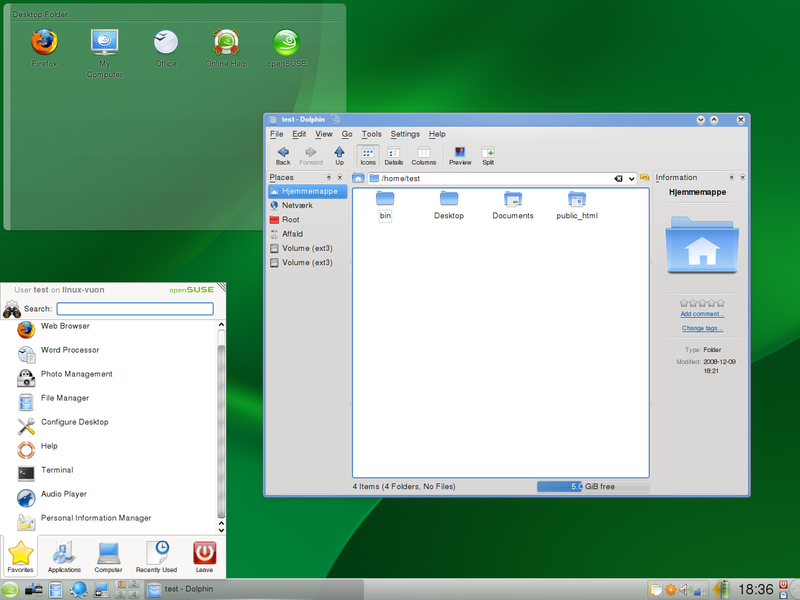 During installation, the user may choose among KDE SC, GNOME, LXDE and Xfce GUIs. openSUSE supports thousands of software packages across the full range of Free software / open source development. In the past, the SUSE Linux company had focused on releasing the SuSE Linux Personal and SuSE Linux Professional box sets which included extensive printed documentation that was available for sale in retail stores. The company's ability to sell an open source product was largely due to the closed-source development process used. Although SUSE Linux had always been open product licensed with the GPL, it was only freely possible to retrieve the source code of the next release 2 months after it was ready for purchase. SUSE Linux strategy was to create a technically superior Linux distribution with the large number of employed engineers, that would make users willing to pay for their distribution in retail stores. Since the acquisition by Novell in 2003 and with the advent of openSUSE this has been reversed: starting with version 9.2, an unsupported 1 DVD ISO image of SUSE Professional was made available for download as well as a bootable Live DVD evaluation. The FTP server continues to operate and has the advantage of "streamlined" installs: Only downloading packages the user feels they need. The ISO has the advantages of an easy install package, the ability to operate even if the user's network card does not work "out of the box", and less experience needed (i.e., an inexperienced Linux user may not know whether or not to install a certain package, and the ISO offers several preselected sets of packages). 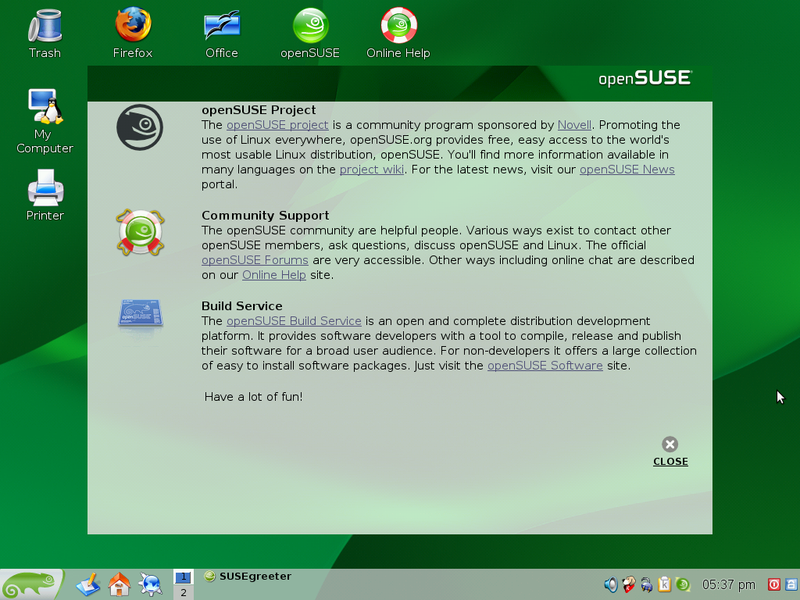 The initial stable release from the openSUSE Project, SUSE Linux 10.0, was available for download just before the retail release of SUSE Linux 10.0. In addition, Novell discontinued the Personal version, renaming the Professional version to simply "SUSE Linux", and repricing "SUSE Linux" to about the same as the old Personal version. 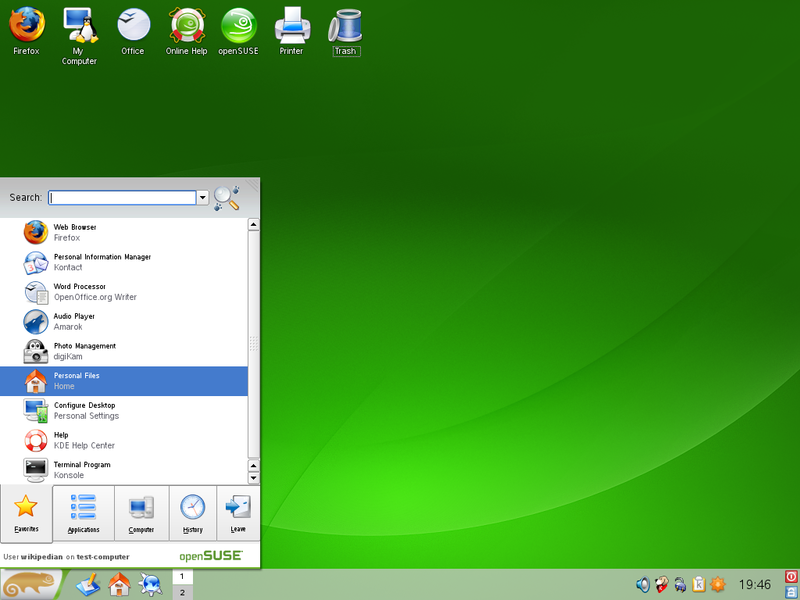 As of version 10.2, the SUSE Linux distribution was officially renamed to openSUSE. Over the years, SuSE Linux has gone from a status of a distribution which includes proprietary software, with restrictive, delayed publications (2 months of waiting for those who had not bought the box, without ISOs available, but installation available via FTP) and a closed development model to a free distribution model with immediate and freely availability for all and transparent and open development. Its popularity continues to grow: as of May 2010, for example, patch download statistics show more than two million unique installations of openSUSE 11.1 and 11.2 alone, with the largest numbers located in Germany (28%) and the United States (14%). On April 27, 2011 Attachmate completed its acquisition of Novell. Attachmate split Novell into two autonomous business units, Novell and SUSE. Attachmate has no plans to change the relationship between SUSE (formerly Novell) and the openSUSE project. openSUSE Download Edition: This is the freely downloadable ISO version, available from the openSUSE downloads page. It is available as a Live-CD version (KDE4 or GNOME) which can be installed on the hard disk, or as a more complete single layer DVD-5. A CD containing additional proprietary software and an additional CD containing files for internationalization (less common languages) are also available. This version does not include any technical assistance, nor printed manuals. openSUSE Retail Edition or openSUSE Box: Users are able to purchase openSUSE box from www.open-slx.com. The box can be ordered at open-slx.com It contains a DVD-9 (dual-layer) comprising the 32-bit and 64, which detects the right architecture during boot time. The second DVD is a KDE-live-system for testing and resucue and also provides the non open source software. The box is delivered with printed documentation and with 90 days user support via email or phone. Since 2009 open-slx is producing the Retail Edition also named openSUSE Box. open-slx includes balsam extensions. DVD2 comes as 32 bit KDE Live-DVD, also including the non-oss addon repositories. openSUSE FTP: There is also a small ISO to install openSUSE directly from FTP (network install). There are mirrors on the two different FTP trees: one for open-source packages (OSS), a second for non-open-source packages or whose license is restrictive (non-oss). The FTP can be used to complement the Download and Retail editions. openSUSE Factory: This is the continuous ongoing development version, from which the development team take out regular snapshots (Milestones and RC) to get the stable openSUSE. openSUSE Tumbleweed: Rolling release, in which new stable versions of packages are made available as soon as they are released. SUSE includes an installation and administration program called YaST which handles hard disk partitioning, system setup, RPM package management, online updates, network and firewall configuration, user administration and more in an integrated interface. YaST also integrates with SaX2 to help users handle their graphics card and monitor, touch displays, and even additional monitors with Xinerama. In more recent times, many more YaST modules have been added, including one for Bluetooth support. AutoYaST is part of YaST2 and is used for automatic installation. The configuration is stored in an XML file and the installation happens without user interaction. ZYpp (or libzypp) is a Linux software management engine which has a powerful dependency resolver and a convenient package management API. 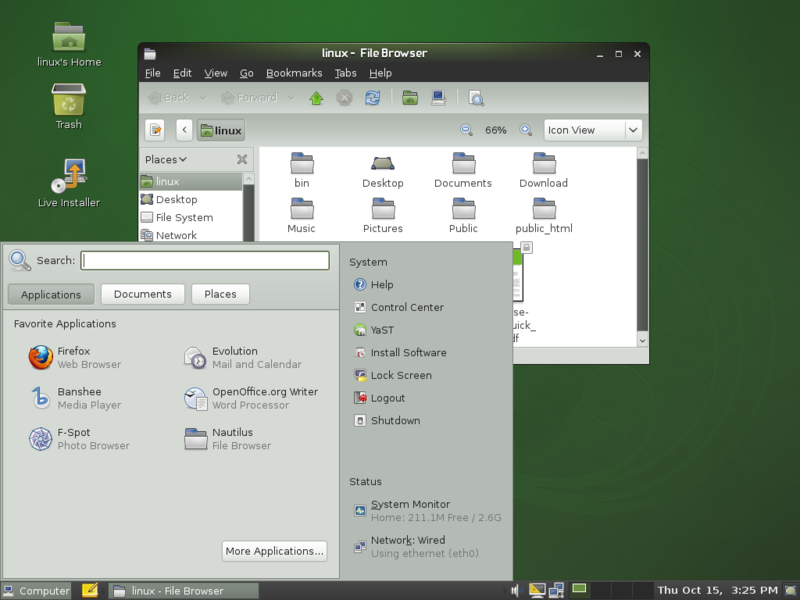 The openSUSE Build Service provides software developers with a tool to compile, release and publish their software for many distributions, including Mandriva, Ubuntu, Fedora and Debian. It typically simplifies the packaging process, so developers can more easily package a single program for many distributions, and many openSUSE releases, making more packages available to users regardless of what distribution version they use. It is published under the GPL. On January 2, 2006, SUSE developer David Reveman announced Xgl, an X server architecture designed to take advantage of modern graphics cards via their OpenGL drivers, layered on top of OpenGL via glitz. Compiz, one of the first compositing window managers for the X Window System that is able to take advantage of this OpenGL-acceleration, was also released. KNetworkManager – a front-end to NetworkManager. Kickoff – a new K menu for KDE Plasma Desktop. The Ximian group became part of Novell, and in turn made and continued several contributions to GNOME with applications such as F-Spot, Novell Evolution and Banshee. The GNOME desktop now uses the slab instead of the classic double-panelled GNOME menu bars. The initial stable release from the openSUSE Project was SUSE Linux 10.0, released on October 6, 2005. This was released as a freely downloadable ISO image and as a boxed retail package, with certain bundled software only included in the retail package. On May 11, 2006, the openSUSE Project released SUSE Linux 10.1, with the mailing list announcement identifying Xgl, NetworkManager, AppArmor and Xen as prominent features. For their third release, the openSUSE Project renamed their distribution, releasing openSUSE 10.2 on December 7, 2006. Several areas that developers focused their efforts on were reworking the menus used to launch programs in KDE and GNOME, moving to ext3 as the default file system, providing support for internal readers of Secure Digital cards commonly used in digital cameras, improving power management framework (more computers can enter suspended states instead of shutting down and starting up) and the package management system. This release also featured version 2.0 of Mozilla Firefox. 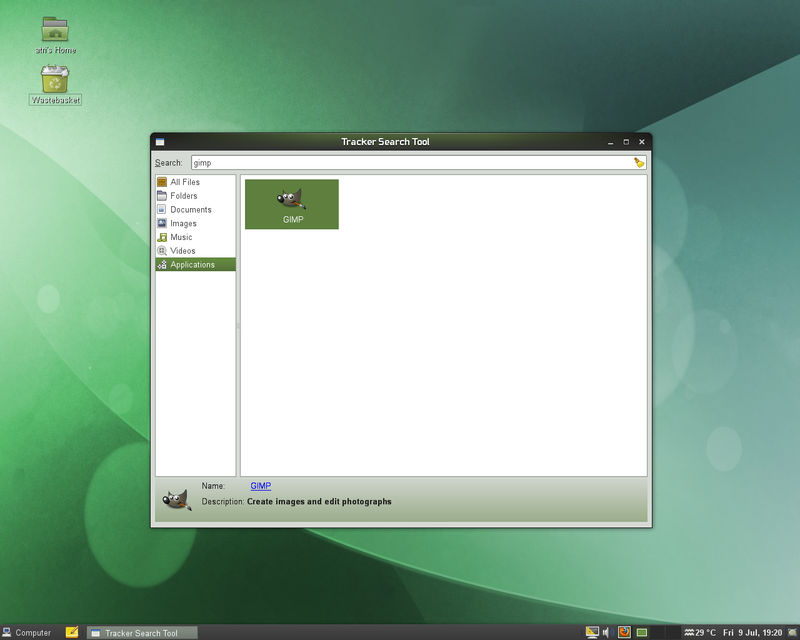 The fourth release, openSUSE 10.3, was made available as a stable version on October 4, 2007. An overhaul of the software package management system (including support for 1-Click-Install), legal MP3 support from Fluendo and improved boot-time are some of the areas focused on for this release. 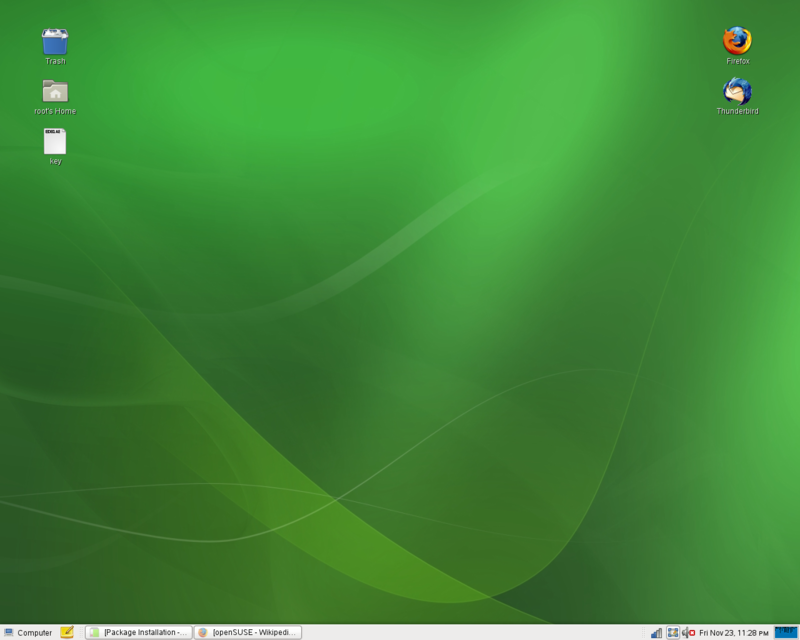 openSUSE 11.0 was released on June 19, 2008. 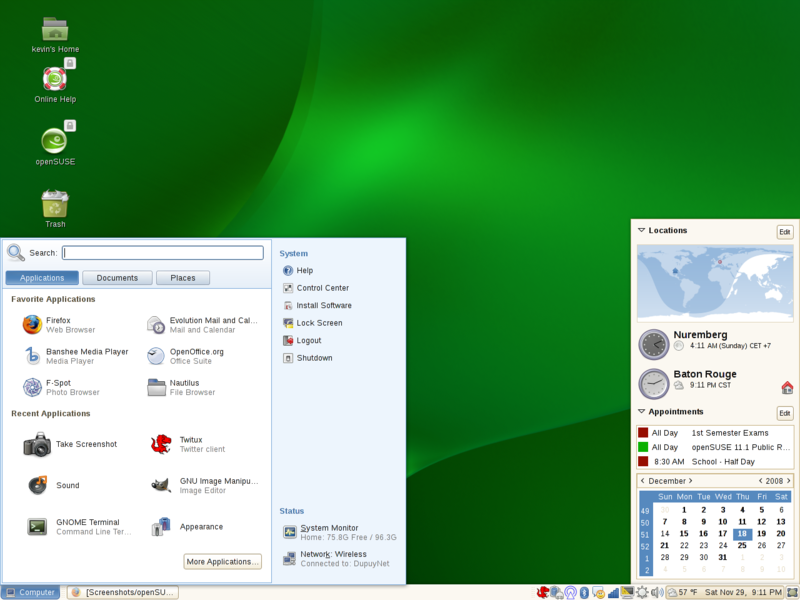 It includes the latest version of GNOME and two versions of KDE (the older, stable 3.5.9 and the newer 4.0.4). It comes in three freely downloadable versions: a complete installation DVD (including GNOME, KDE3, and KDE4), and two Live CDs (GNOME, and KDE4 respectively). A KDE3 Live CD was not produced, however, due to limited resources. Package management and installation were made significantly faster with ZYpp. 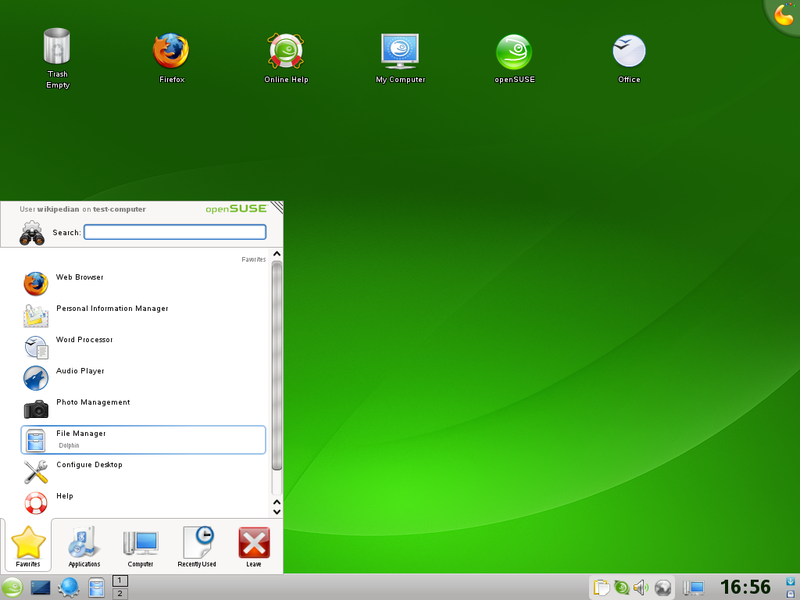 openSUSE 11.1 was released on December 18, 2008. Updated software includes GNOME 2.24.1, KDE 4.1.3 + KDE 3.5.10, OpenOffice.org 3.0, VirtualBox 2.0.6, Compiz 0.7.8, Zypper 1.0.1, continued improvement in the software update stack, X.Org 7.4, Xserver 1.5.2 and Linux kernel 2.6.27.7.
openSUSE 11.2 was released on November 12, 2009. It includes KDE 4.3, GNOME 2.28, Mozilla Firefox 3.5, OpenOffice.org 3.1, improved social network support, updated filesystems such as Ext4 as the new default and support for Btrfs, installer support for whole-disk encryption, significant improvements to YaST and zypper, and all ISO images are hybrid and now support both USB and CD-ROM boot. 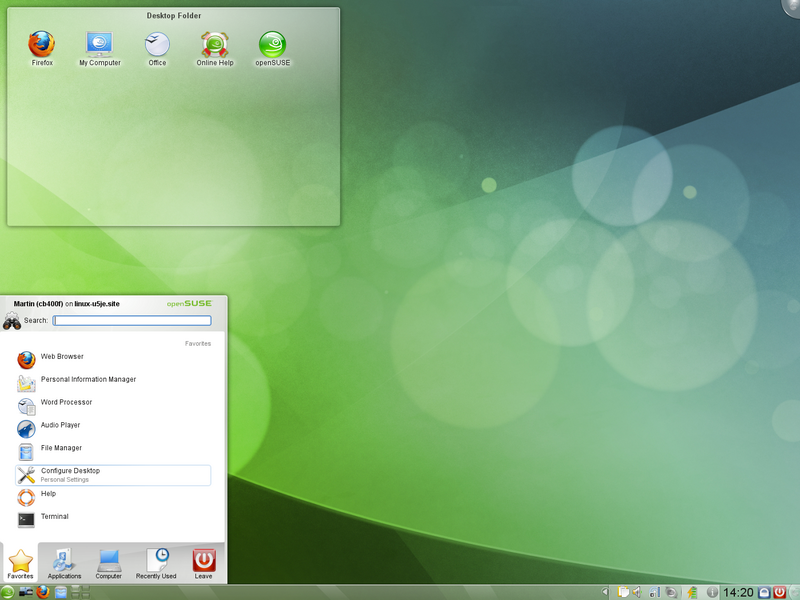 openSUSE 11.3 was released on July 15, 2010. It includes KDE 4.4.4, GNOME 2.30.1, Mozilla Firefox 3.6.6, OpenOffice.org 3.2.1, support for the Btrfs filesytem and support for LXDE. It also updates the Linux kernel to version 2.6.34.
openSUSE 11.4 was finished on March 3, 2011 and released on March 10, 2011. It includes KDE 4.6.0, GNOME 2.32.1, Mozilla Firefox 4.0 beta 12, and switched from OpenOffice.org to LibreOffice 3.3.1. It updates the Linux kernel to version 2.6.37. The openSUSE project aims to release a new version every eight months. It supports each release with critical updates for two years from the release date. Starting with version 11.2, critical updates will be provided for two releases plus two months, which at the current release cycle of 8 months would result in a support lifetime of 18 months. The actually achievable minimum specs differ. Older processors that still belong to the i586 family are usable, for example the AMD K6-2. When excess language/translation files and documentation are removed and X is not needed, decent console-based router systems can be made using 300 MB disk space. Most console workloads also cope with 128 MB RAM at the cost of increased swap activity in tight situations.